If you're staying out near the Stuttgart airport, here's a really nice route out in the woods. There's actually a choice of three routes of different lengths that all start at the same place. 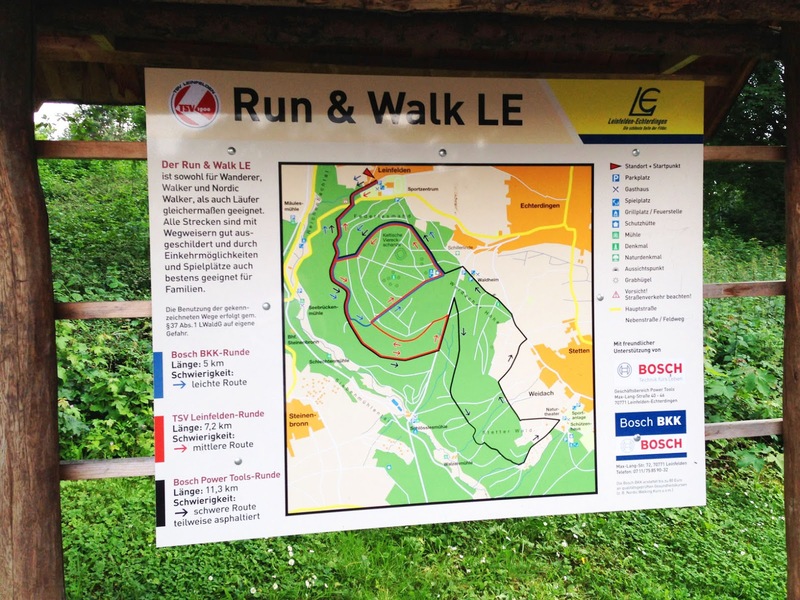 This is the Run & Walk LE trail system set up by the TSV Leinfelden sports club, out near the airport. 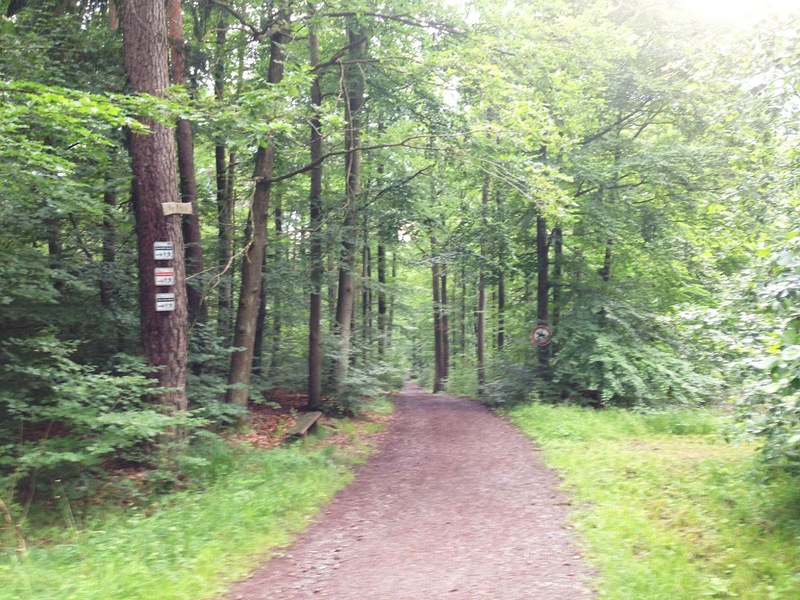 The trails are well marked, take you through beautifully wooded hills, and provide a nice mix of challenges. It begins at the Leinfelden sports center at the southwest corner of Leinfelden town. 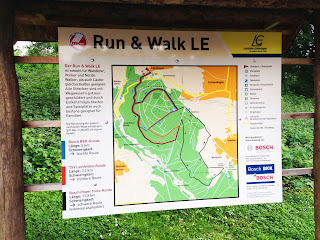 This run is actually 2.5 km (1.5 miles) longer than those trails because it begins at the Leinfelden train station, where a couple of hotels are located. 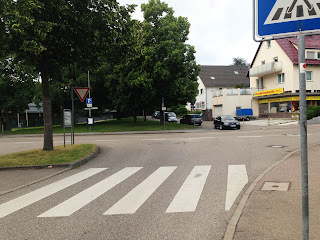 And if your hotel isn't directly in Leinfelden (maybe it's in Echterdingen, right next to the airport), you can just jump in the S-Bahn train (line 1) and ride the one stop to Leinfelden and start the run there. It costs just €2.20. Come out of the station on the west side, facing Stephan's restaurant. Now turn left and run down Bahnhofstraße. After 300 meters, this street ends as it runs into Musberger Straße. Just continue straight across the intersection into the short street ahead, Narzissenstr. 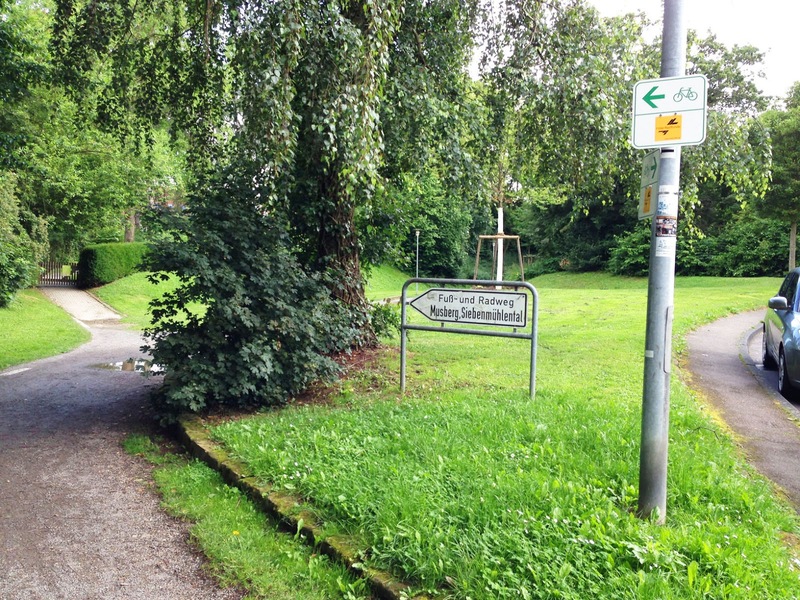 You'll see a public footpath leading off in just 50 meters, with signs for a bikeway and "Fuss und Radweg Musberg". Follow that gravel footpath, running westwards. In just a couple of hundred meters, just before the path goes into a tunnel-like opening under a bridge, take the ramp up to the left, following the bike-path signs. 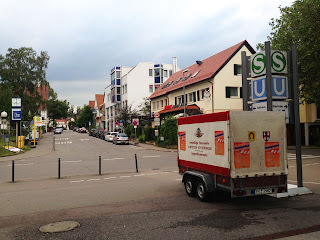 Turn left at the top of the ramp, onto Schönbuchstraße, running south. 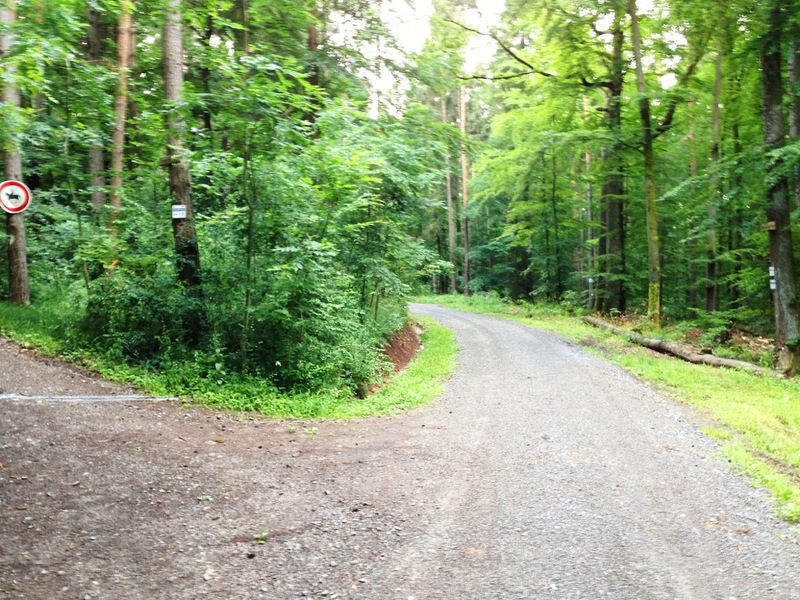 The street will curve to the right, going past a small school, and it ends right at the big trail map at the sports center. The trail map at the sports center, showing all 3 trails. Take your choice! The map shows the three possible trails: Blue (a 5-km loop), Red (a 7.2-km loop) or Black (a 11.3-km loop). Take your choice. They all begin together and share the next one kilometer. Then the Blue route circles back, while Red and Black go further south until Red circles back. They also share the last 2.3 km as they all come together again. There is not really a difference in difficulty between the three: they all climb the same big hill. The Red and Black routes just add some extra rolling woodlands to the basic Blue route. Standing at the route map, turn right and follow the path. It first goes uphill and crosses a road. But you are soon surrounded by quiet woods, with the main hill rising to your left. The blue, red, and black trail signs and are large and plentiful along the whole route. 1.7 km after the trail map, the Blue trail turns to the left and heads straight uphill. 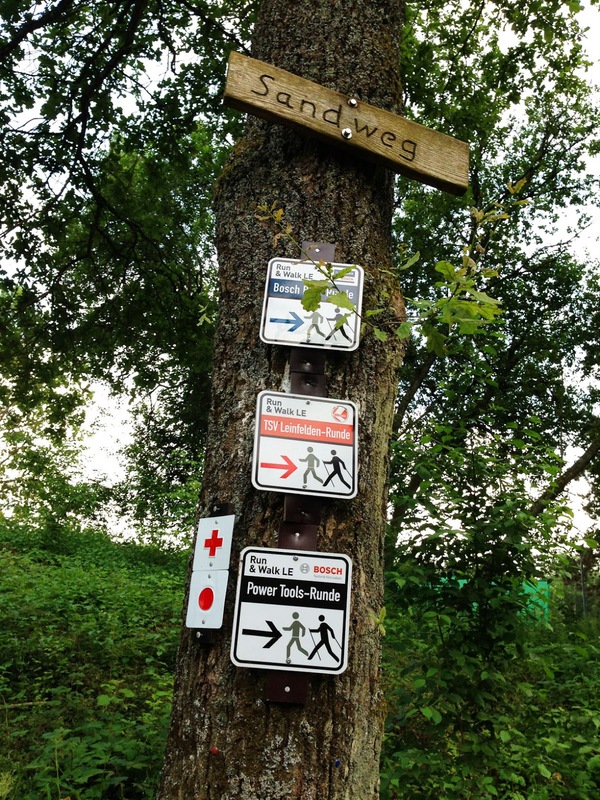 The Red trail starts going uphill later, when it turns onto the "Alte Poststraße" trail. 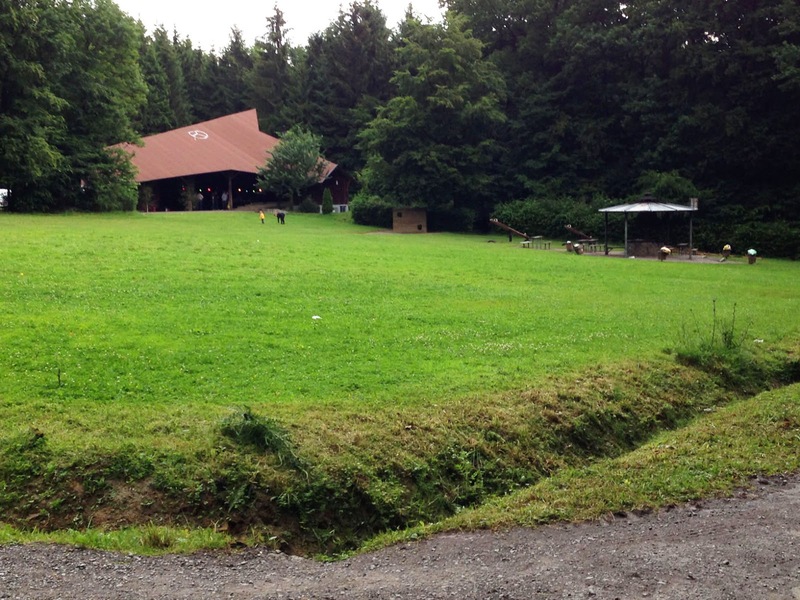 All three trails come together at a clearing at the top of the main hill, where a grill-pavilion and playground create a woodsy venue for local townspeople. 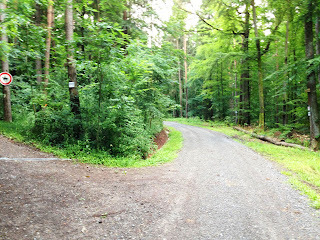 All three trails then start going northwards together, downhill, along a paved path. But before they go all the way down the hill, the Run & Walk trails turn left to cut westwards along the hillside. At the spot where a little picknick table sits under a little chestnut tree, the trails turn left and go steeply downhill, where they connect into the first part of their route and return to the sports center. From the sports center, follow the original route through town back to the train station along Schönbuchstraße and Bahnhofstraße.